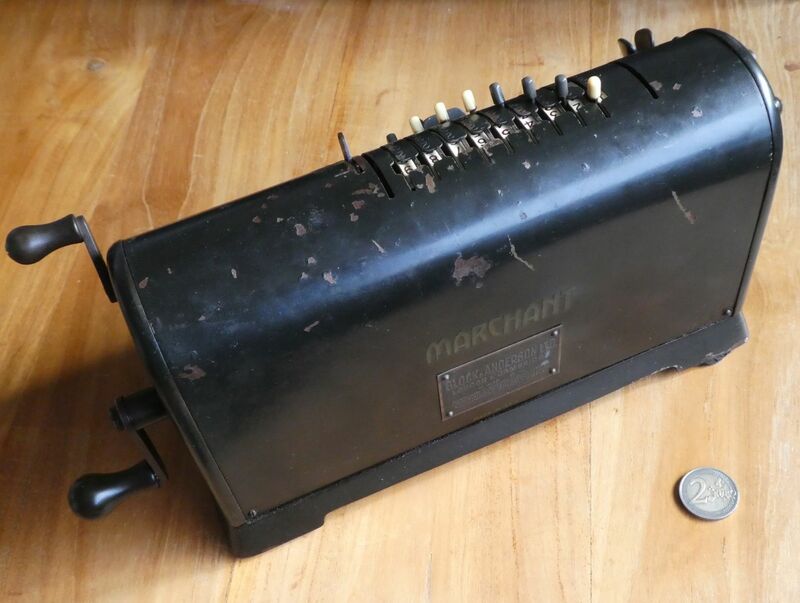 The Marchant XL has a moving carriage with an 18-digit register, and in the main body of the machine a 9-digit revolution counter to the right of a set of 9 input levers. 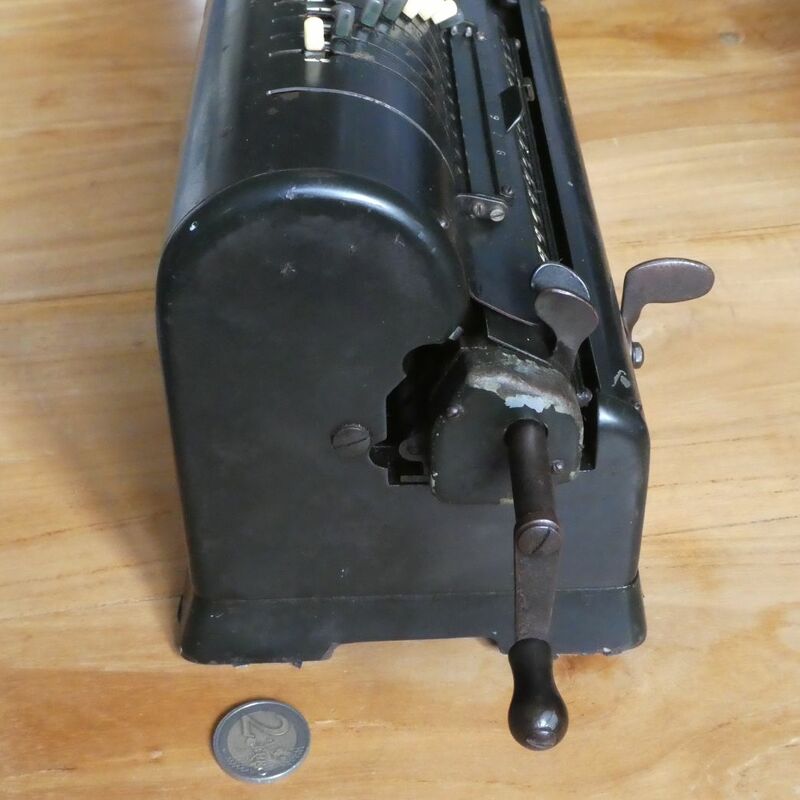 It looks similar to a pinwheel machine, and is used in the same way. 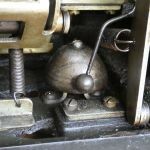 Internally it uses a different mechanism however, as evidenced by the fact that the input levers stay in place when the crank is rotated. 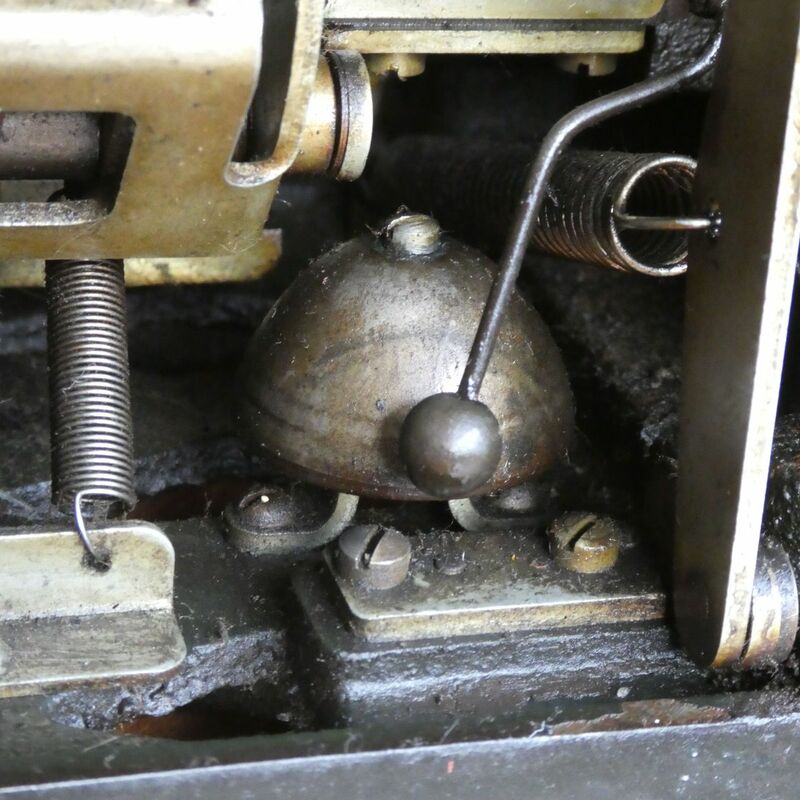 Pushing the small lever on the front to the left or right will shift the carriage one in that direction, or the carriage can be moved a longer distance by using the grips at the left of the carriage. 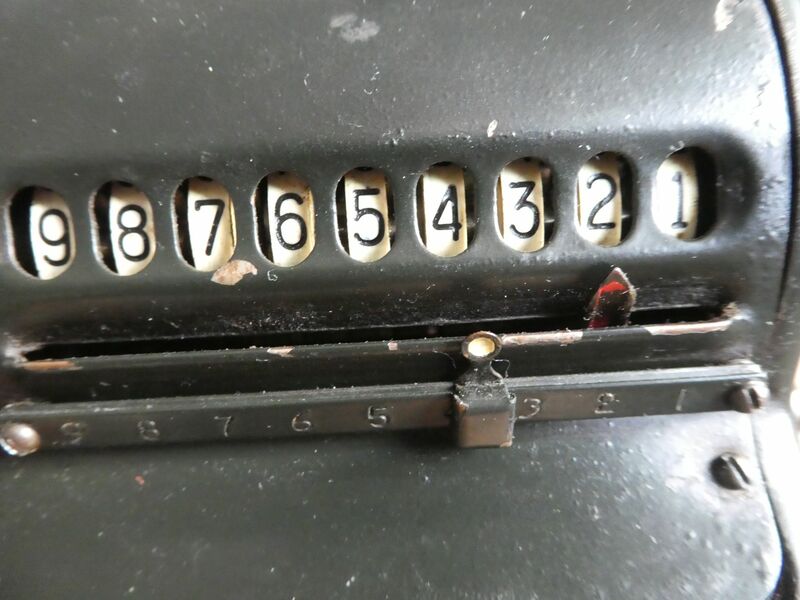 The counter at the top right has a pointer indicating the currently active digit, and this moves whenever the carriage moves. 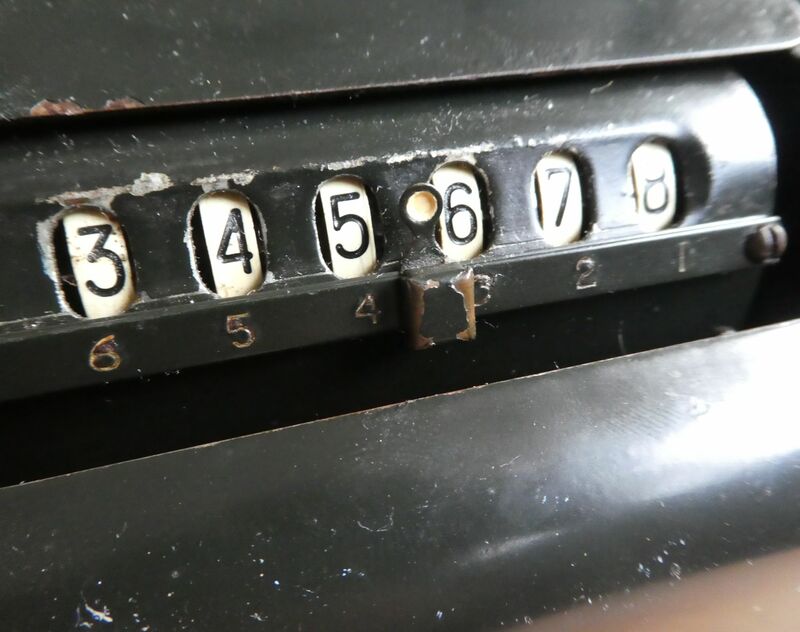 The switch located between the counter and the input selects whether the counter counts additions of subtractions, for use in multiplications and divisions respectively. 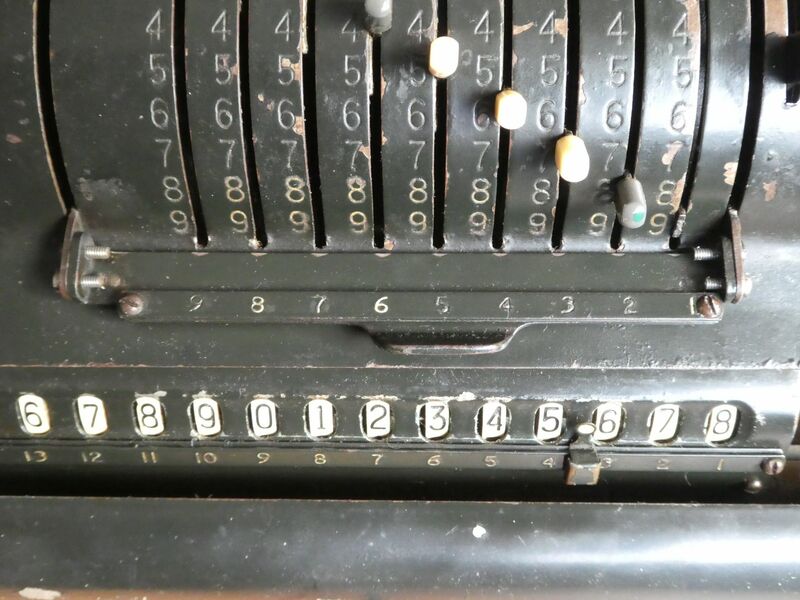 The counter and the main register both have a small crank that you can turn to reset them. The input can be cleared by pushing the bar upwards, which pushes all the input pins up to zero. Internally the XL uses an "adaptive segment" mechanism. Whereas a pinwheel is a gear with teeth that extend or retract when the input is set, and stay in that state when the crank is turned, the Marchant XL has wheels in which a whole segment with 9 teeth retracts at just the right moment during the rotation of the crank so that it effectively acts as if it had fewer teeth. This XL is in reasonably good condition. The input pin for the units has broken off, so it is a bit difficult to use, and the units digit therefore also won't be cleared by the bar. Other than this, it only has some minor cosmetic blemishes. 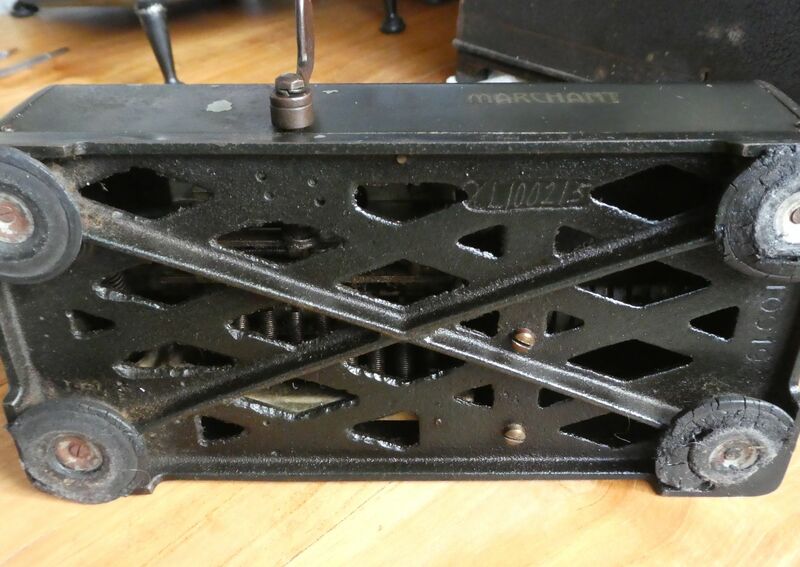 This model was made from 1923 till about 1935. It has serial number XL100215, and as this is higher than any other I have found online, it must be one of the last ones made. 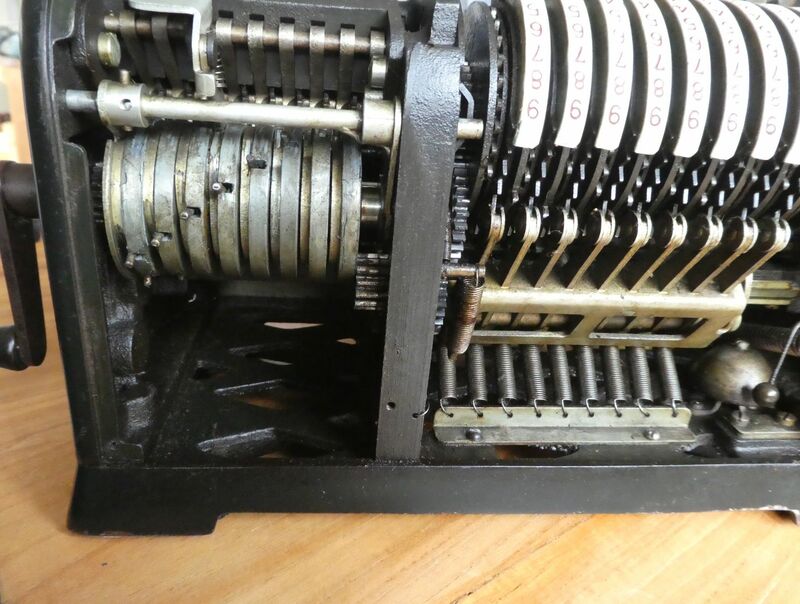 Note that the toothed segments in this machine are hinged so they rotate when retracting instead of sliding directly inwards. 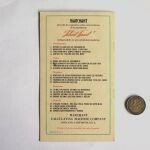 This improvement was patented in 1930. 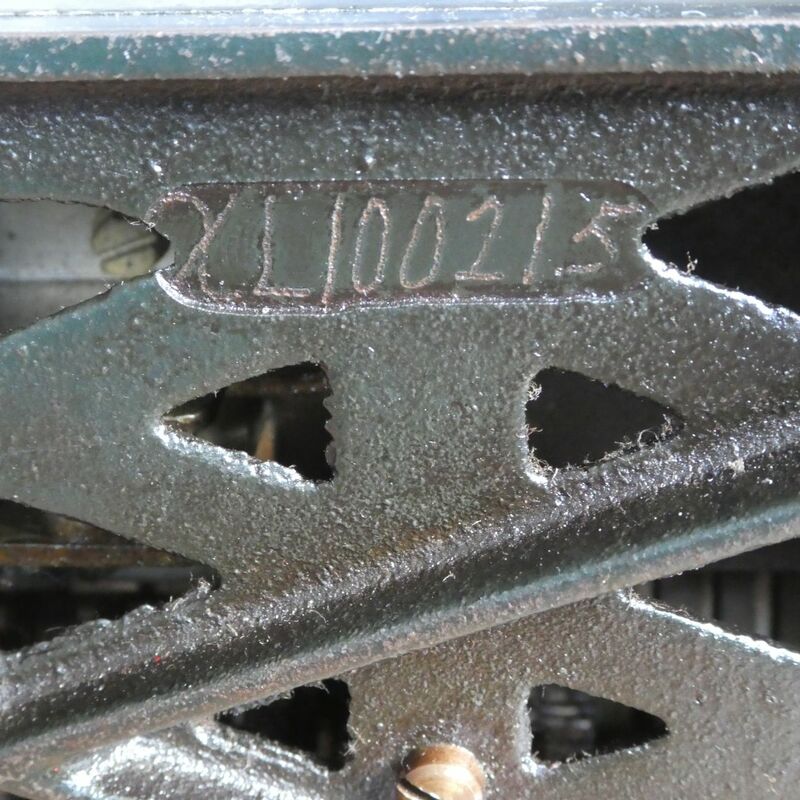 The serial numbers seem to start at 90000, so it seems that a little over 10,000 of them were made. 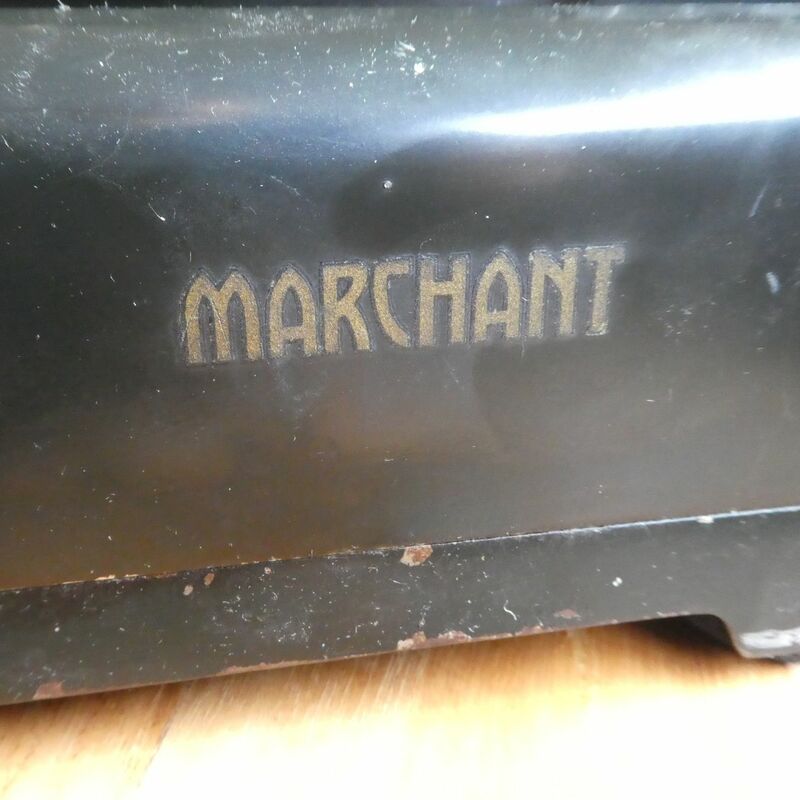 Here is a video where I demonstrate the Marchant XL. This video shows the internal mechanism in action. 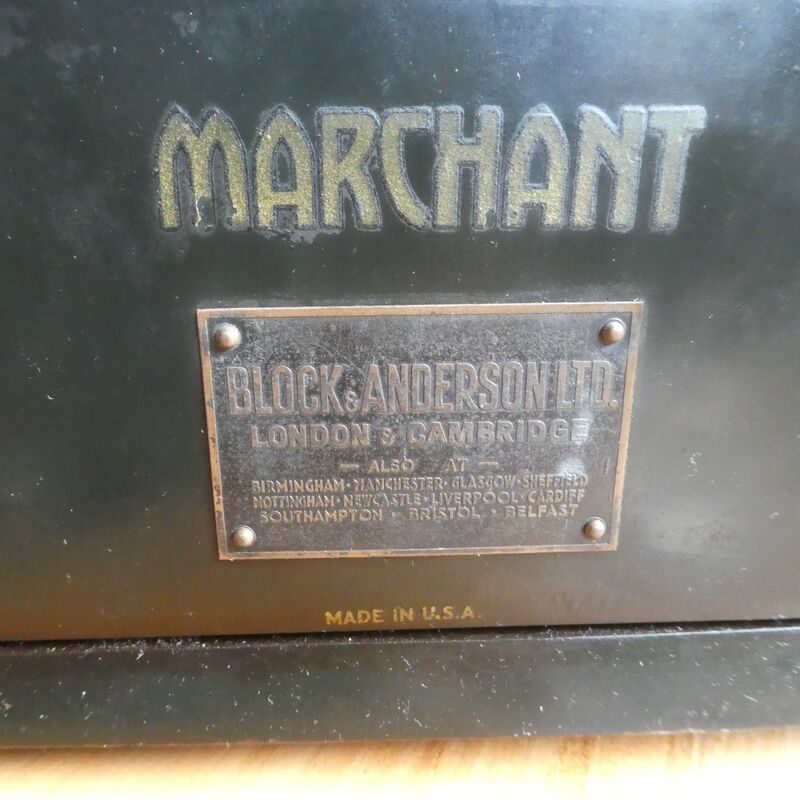 The Marchant Calculating Machine Co. was founded in 1911 by the brothers Rodney and Alfred Marchant. They were based in Oakland, California. At first they made an Odhner-type pinwheel machine, the Standard, which came in two register sizes. In 1915 an electrically driven version was made, too. In 1917, they released a new model called the Pony which was about 20% smaller in size and lighter than the Standard. 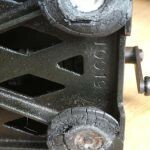 Due to patent challenges they had to develop a different mechanism, and in 1921 the engineer Carl Friden came up with the adapting segment design. Apparently the Pony was then changed to use that mechanism, though I have not been able to confirm that. 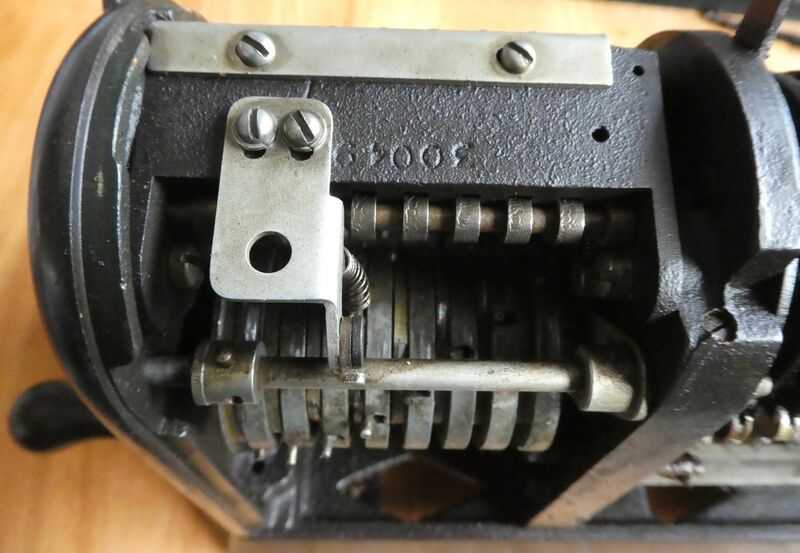 This adapting segment mechanism was subsequently used in the models XL and XLA, released in 1923. 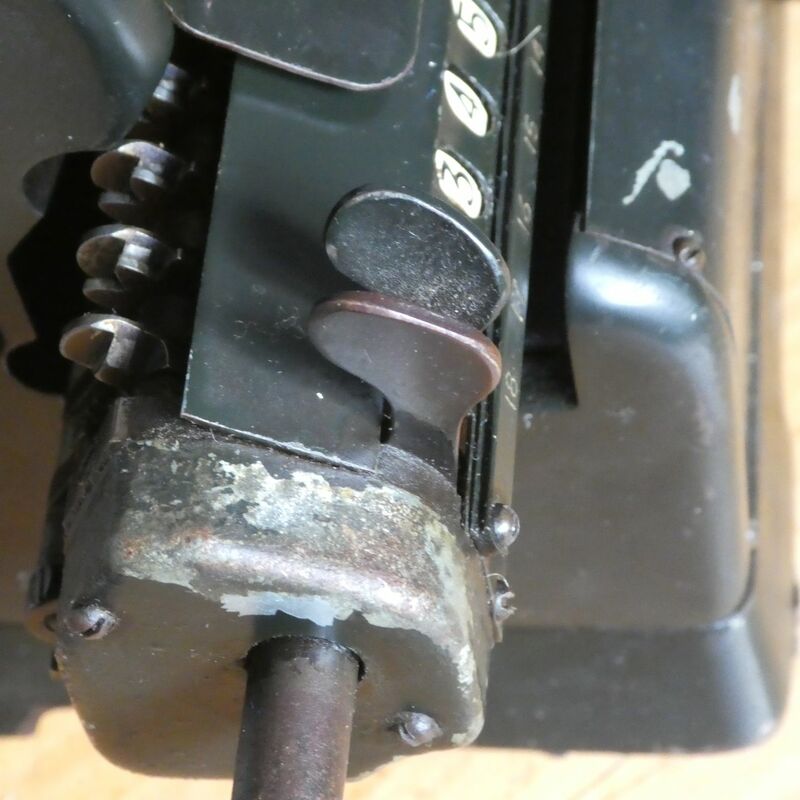 While the XLA still had the register and counter on the moving carriage, looking very similar to the previous Odhner type models, the XL had the counter in a fixed position to the right of the input. Many models and variations were made based on the XL - usually with a full keyboard instead of setting levers, and often with electric drive. 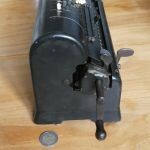 In the early 1930s the depression forced them to reduce the number of models and variants from 40 to just 2, one of which was the XL. 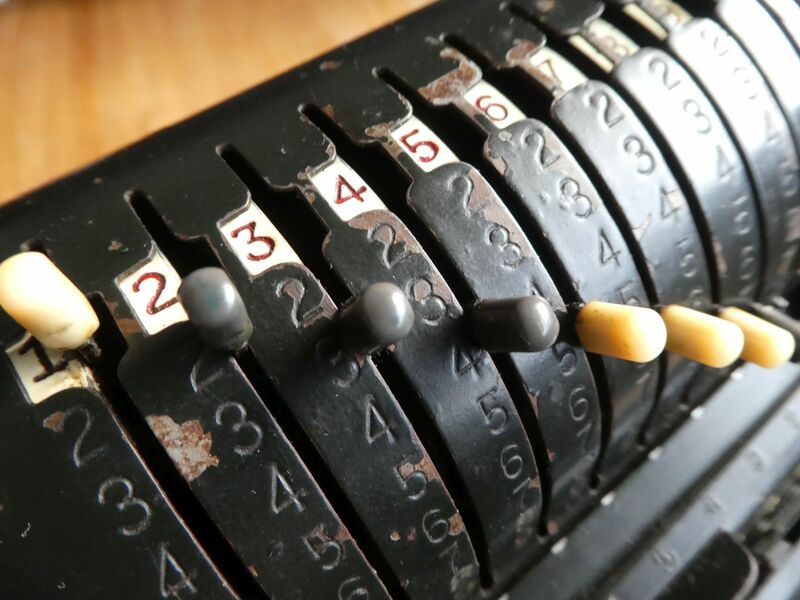 Carl Friden left in about 1930 to found his own rival calculator company in San Leandro. An entirely new mechanism was invented by Harold Avery. 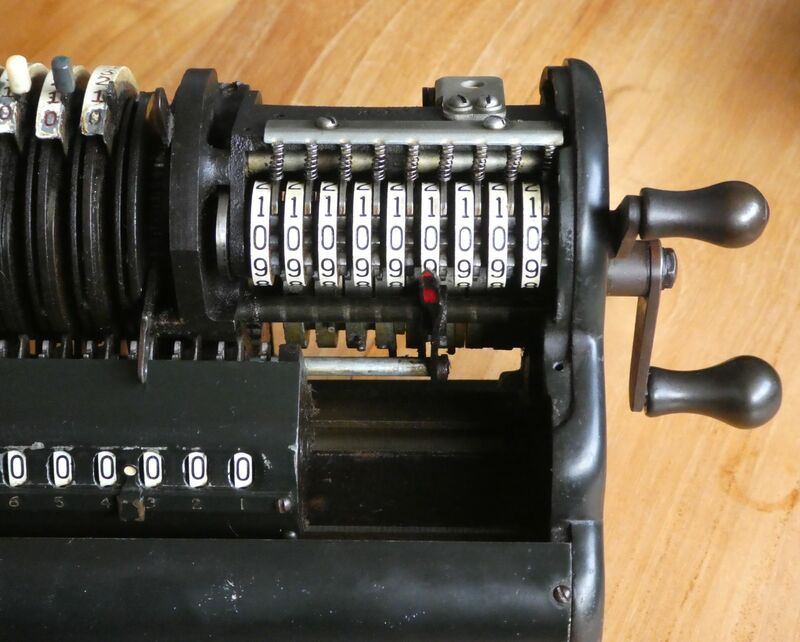 The first machines based on this mechanism were released in 1934, and called "Silent Speed". 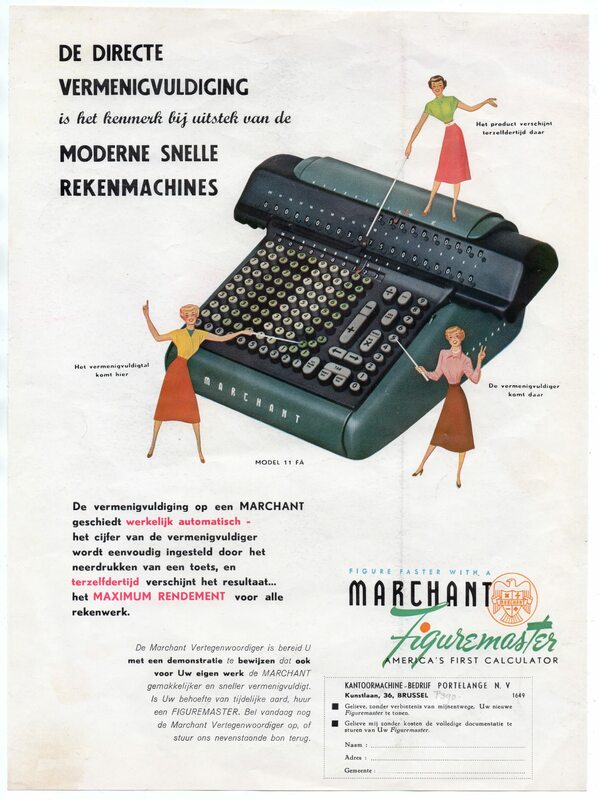 After the war, improved versions were called "Figuremaster" or "Figurematic", and later "Transflo". 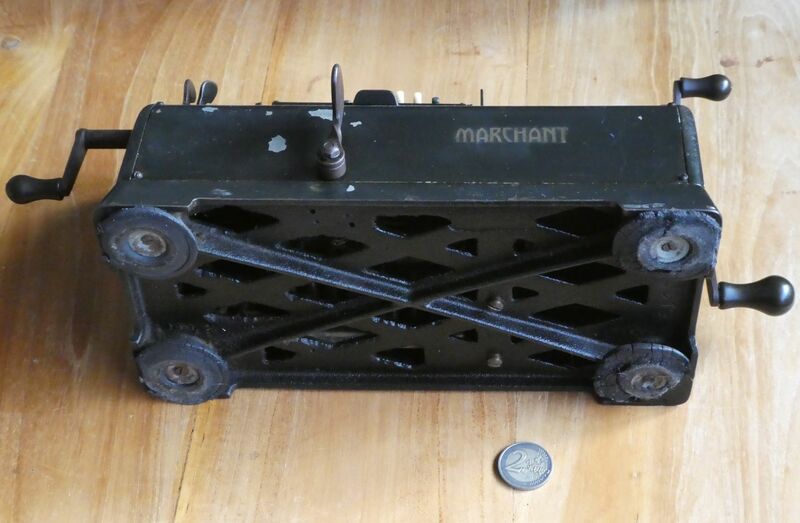 Marchant continued to produce models using only this mechanism until the 1960s. 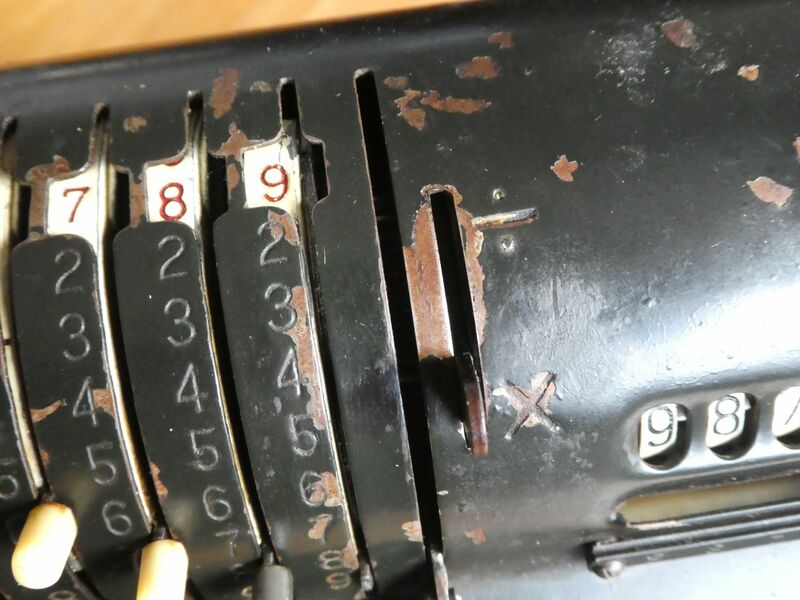 The register uses a planetary gear differential at each digit to allow a number wheel to be driven from two inputs added together - the number wheel to its right and the input. This idea was not new (Burroughs calculators have this), what is new is that this gear was permanently engaged. This means that carries were not triggered, but successive wheels were connected by a 10:1. gear ratio. This would normally mean that if for example the 25 were displayed, the tens wheel would be halfway between 2 and 3. 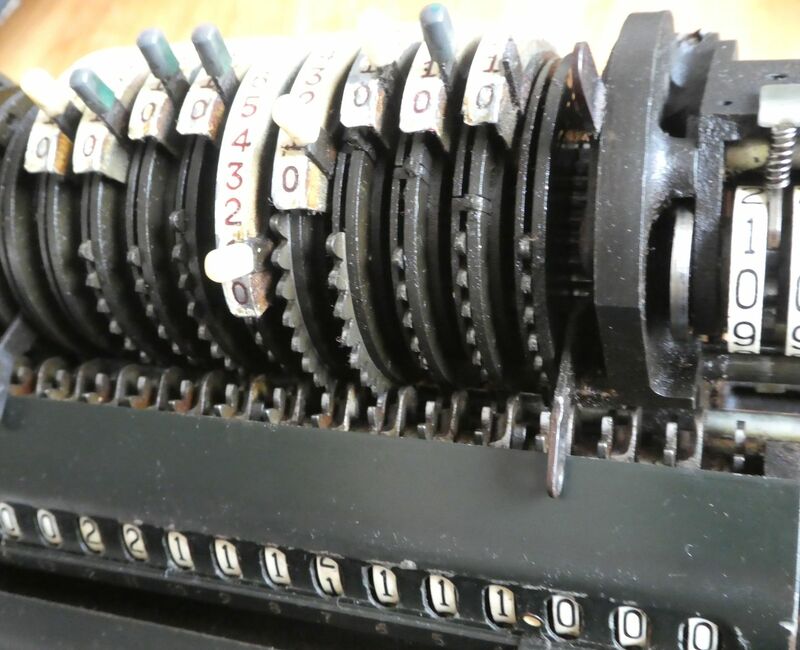 To keep each number wheel centred on a whole number when displaying the result, they had an additional cam gear to offset them correctly. 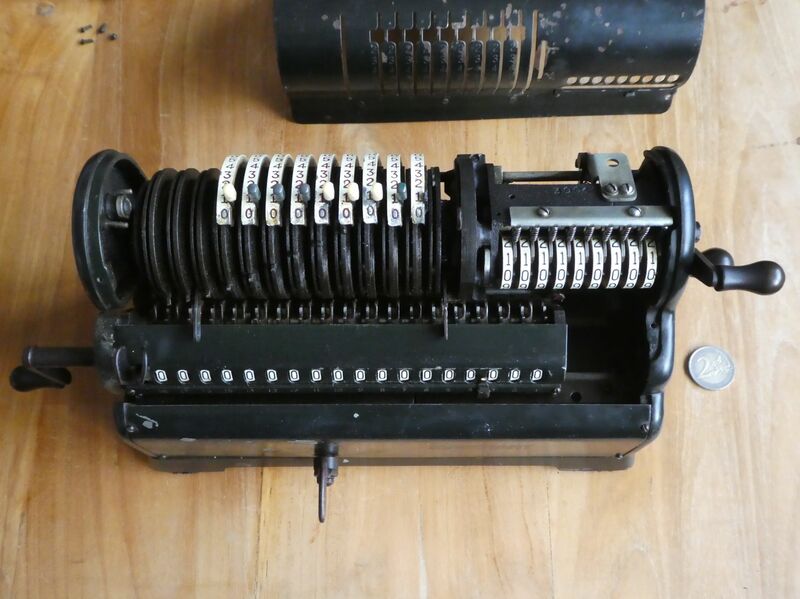 Each column in the keyboard essentially acted as a 9-speed transmission, so that when a 9 was selected, this would drive the number gear 9 times as fast as when a 1 was selected. 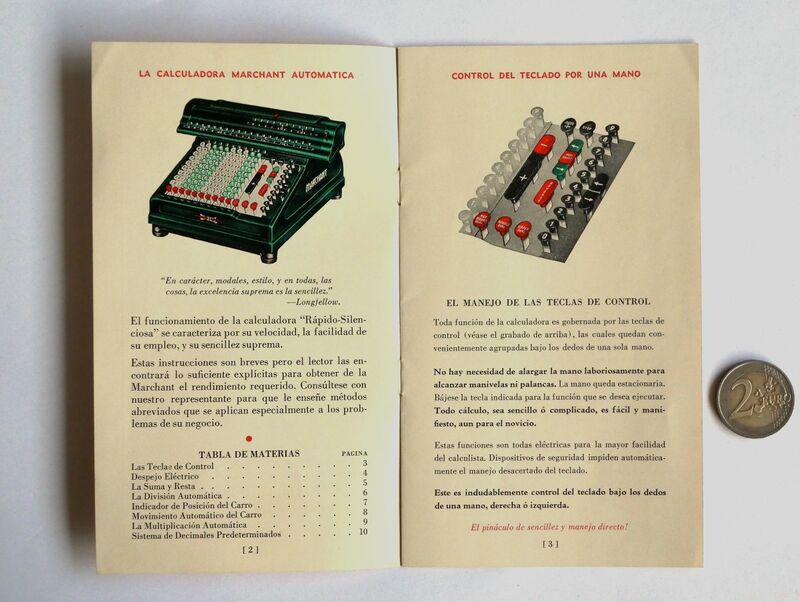 This smooth continuous direct transmission during the calculation allowed these machines to be much faster than any other calculators. 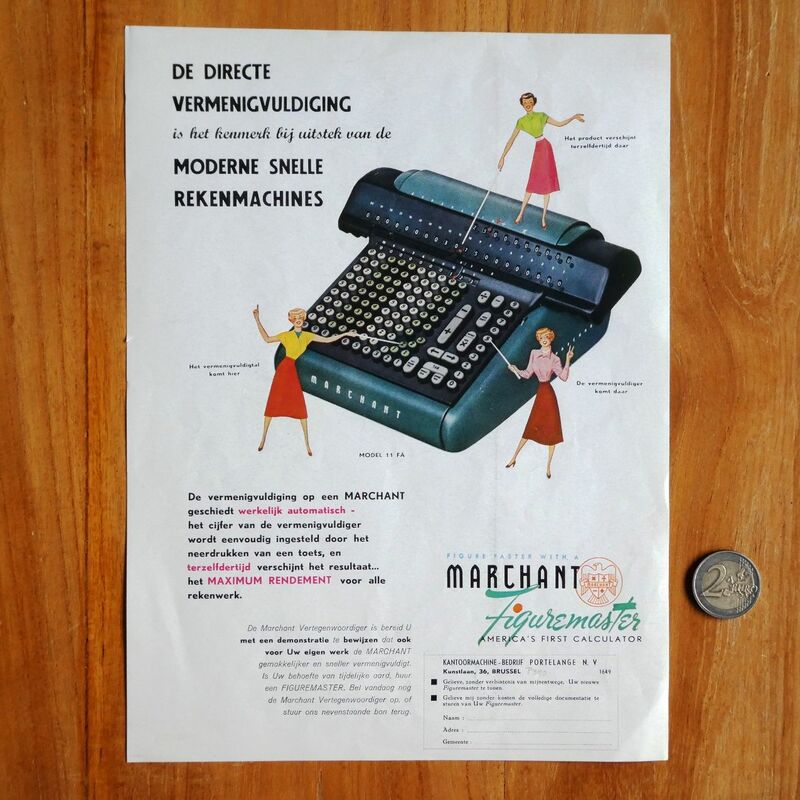 In 1958, Marchant was bought by the typewriter company Smith Corona, to form SCM. While they did move into electronic desk calculators, they could not compete against electronic pocket calculators, so stopped making calculators in the early 1970s. 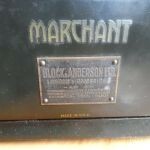 Below are descriptions and photos of my collection of material about the Marchant machines. 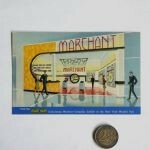 If you are interested in adverts from newspapers and magazines, my Marchant Advertisements page has a huge collection of scans of adverts from 1912 to the 1970s that I found in online archives. 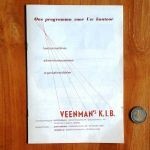 There is also a separate page with Marchant Articles from newspapers, books and magazines. 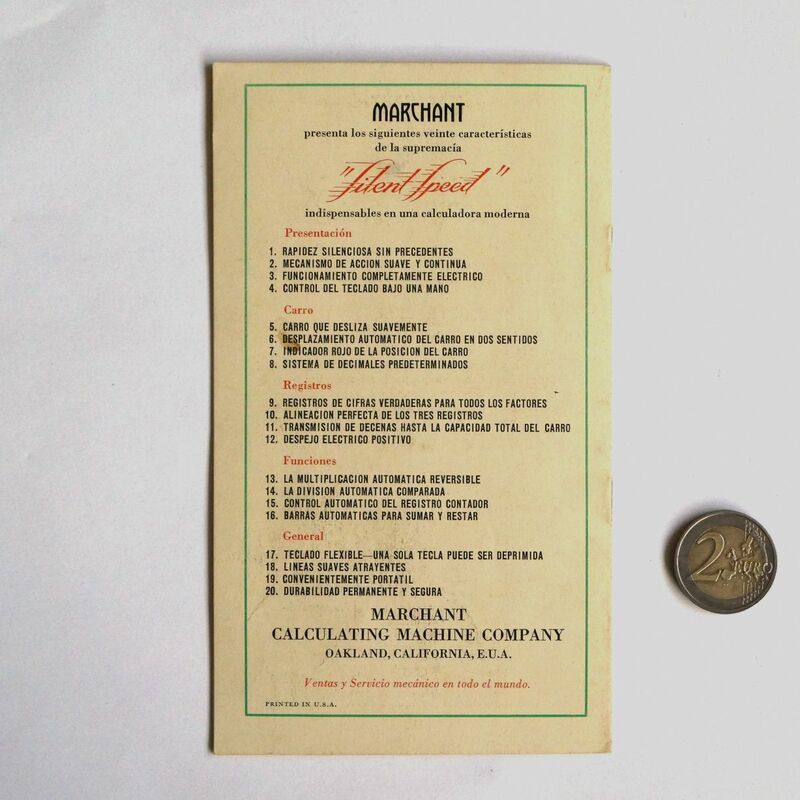 Marchant Calculating Machine Company; Oakland, California, U.S.A. 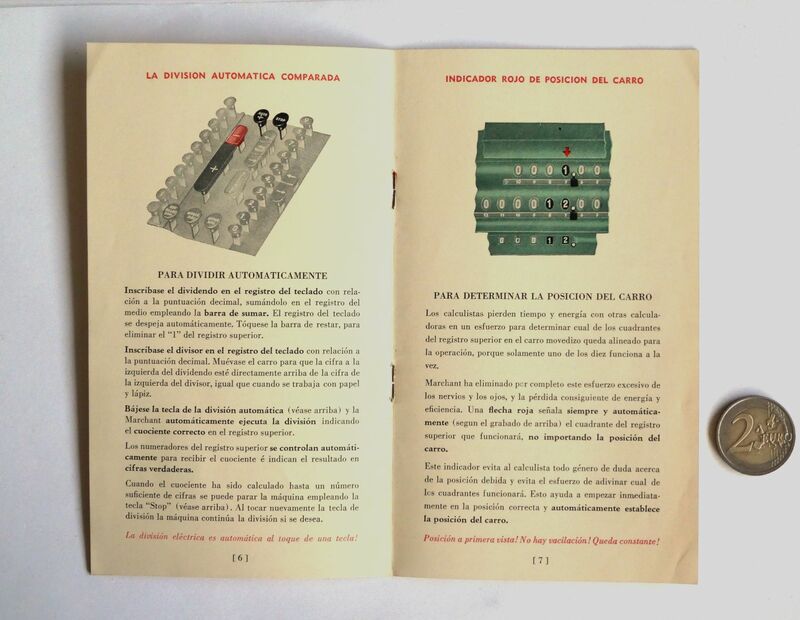 This is a small Spanish language manual for Marchant's Silent Speed calculator. 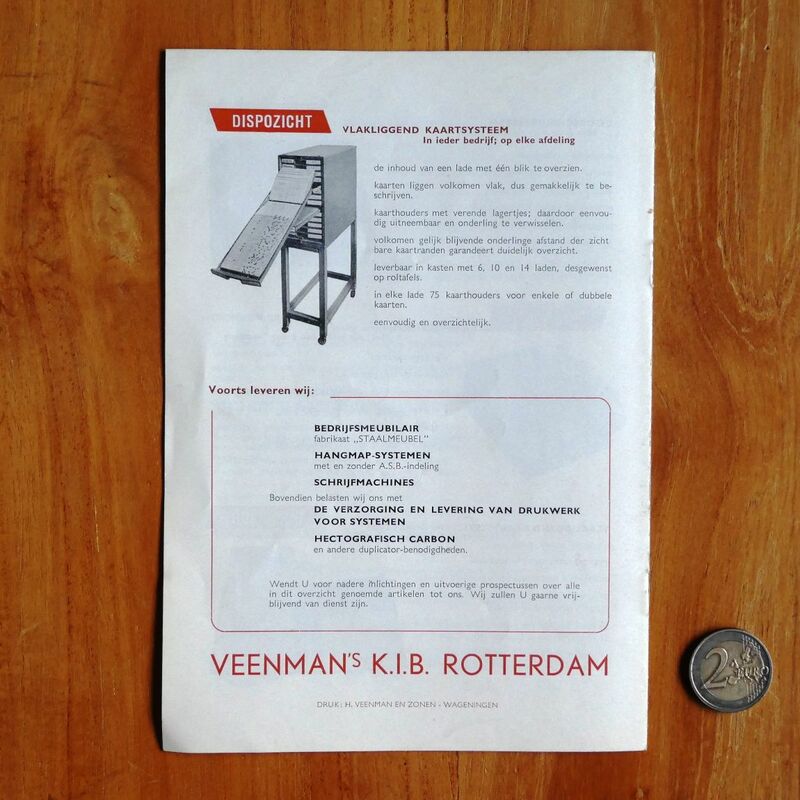 A flyer for the Figuremaster in the Dutch language. 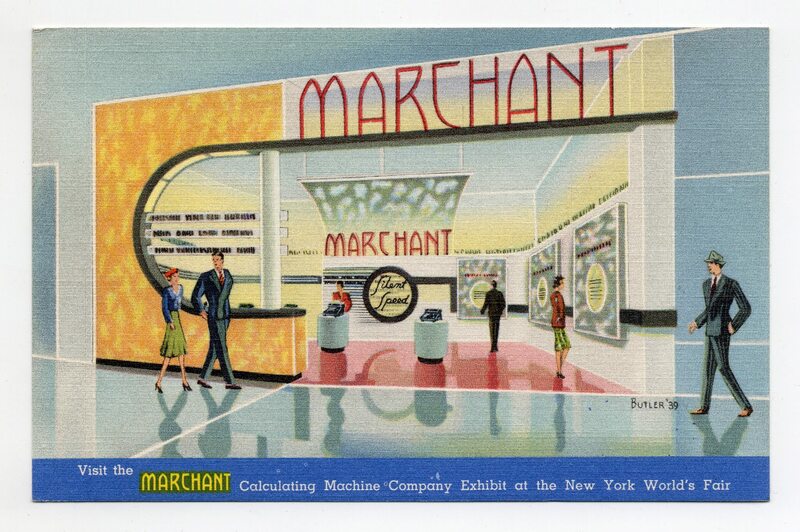 Postcard illustrating the Marchant Calculating Machine Company Exhibit at the 1939 World's Fair held in New York. 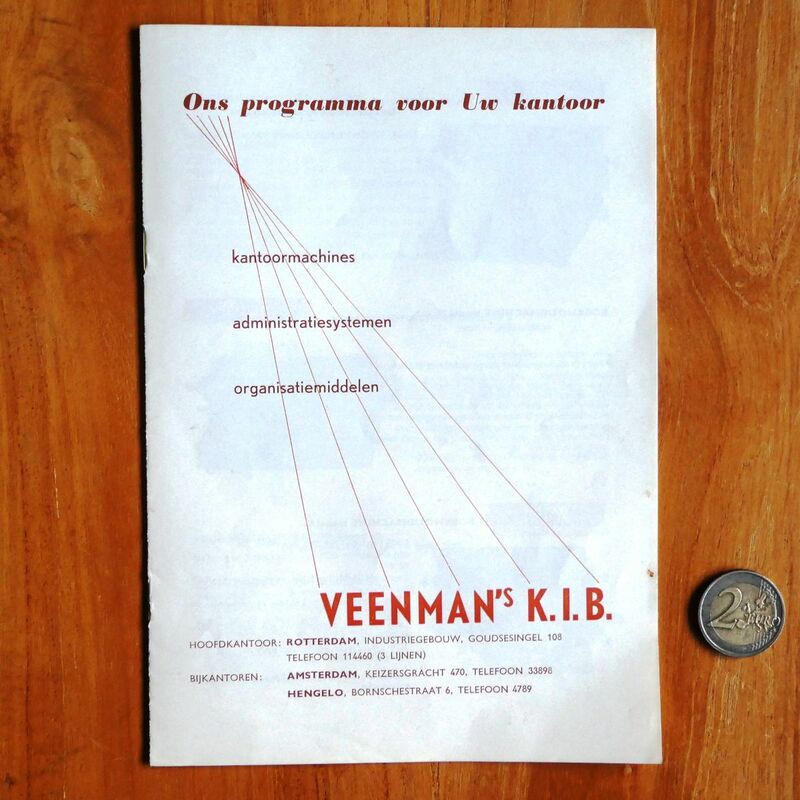 This is a small brochure for Veenman's K.I.B., a Dutch company supplying office equipment. 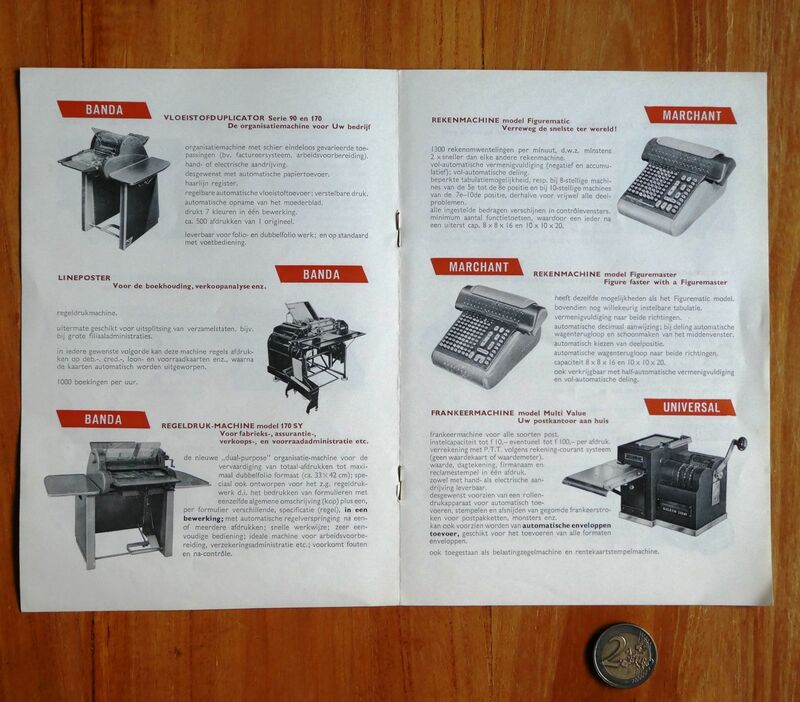 It includes Marchant Figurematic and Figuremaster calculators, next to various other machines such as dictaphones and copiers. 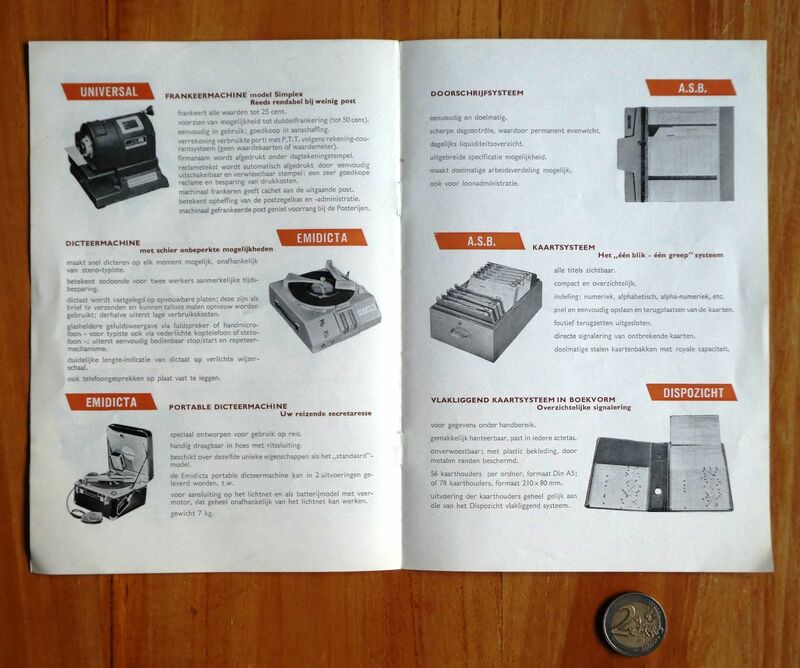 Here is only a small selection of the patents that were filed for Marchant calculators. 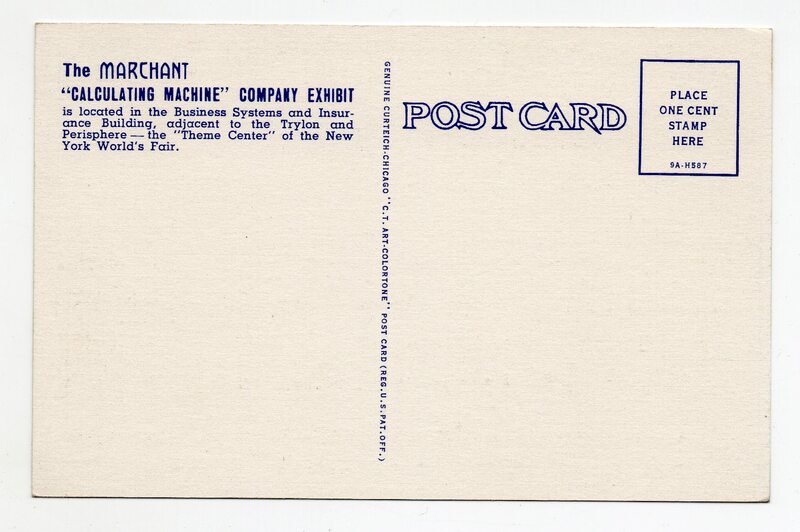 US 1,476,197 1921-01-17 1923-12-04 Carl M. Friden Adapting segment mechanism. See also AT 102,775 B, CA 239,984, CH 98,111, DE 393,953 C, DK 31,824 C, FI 9,297. 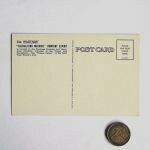 US 1,476,198 1921-11-23 1923-12-04 Carl M. Friden Transfer timings. 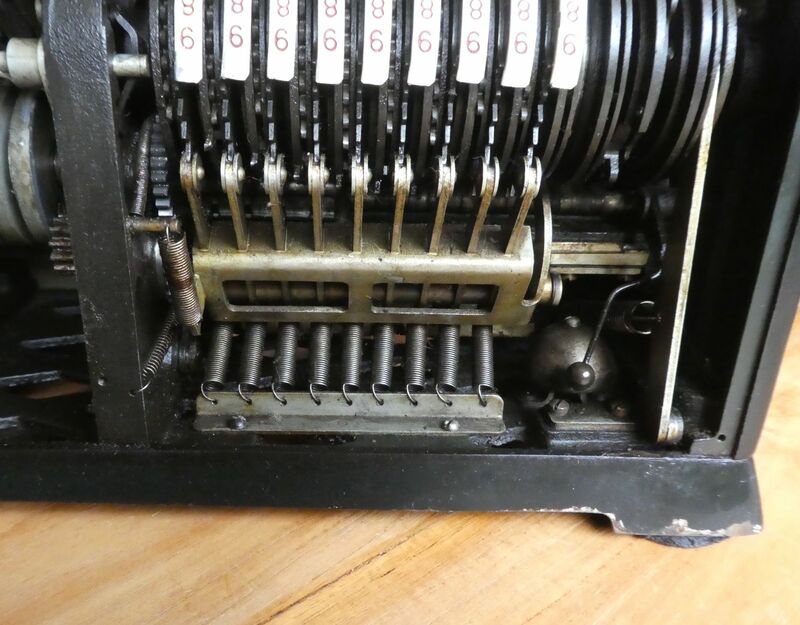 US 2,028,540 1922-02-27 1936-01-21 Carl M. F. Friden Calculating machine, with keyboard. 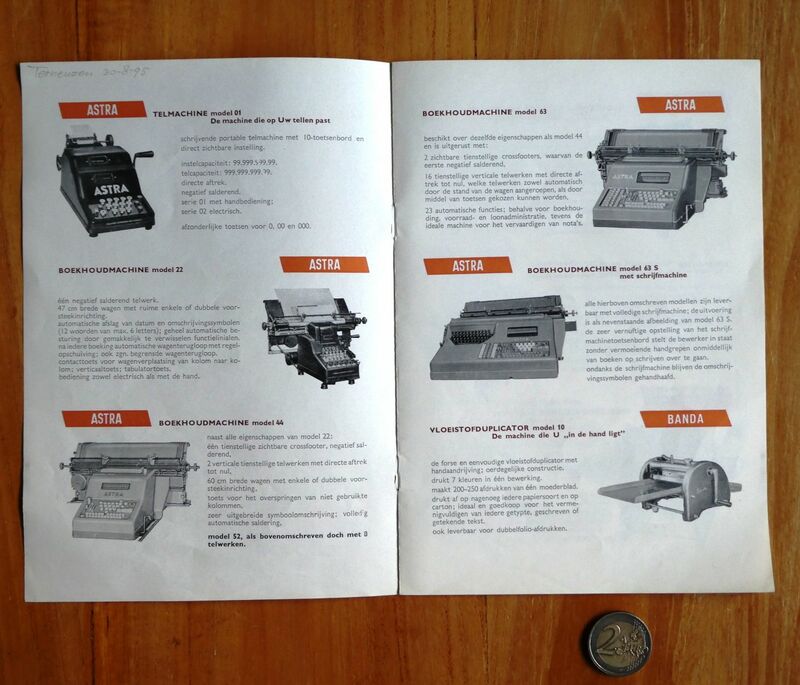 See also AT106556B, CA259720, CH105276, CH113767, DE408641C, DK33191C, FI9828. 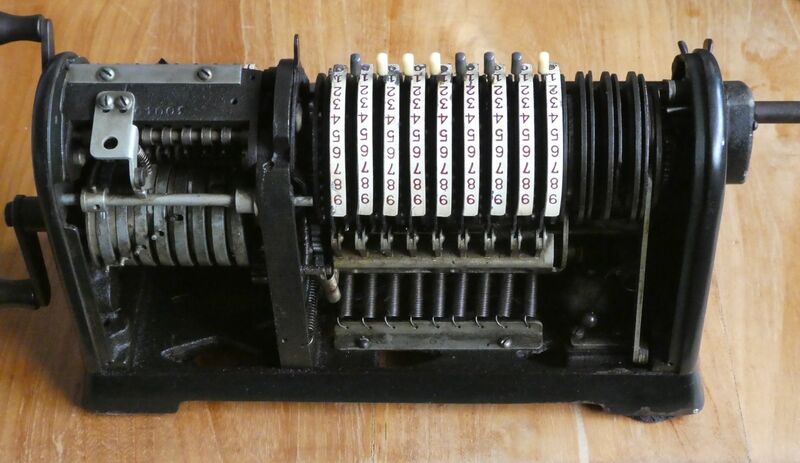 US 1,524,924 1923-07-17 1925-02-03 Carl M. F. Friden Adapting segment mechanism with keyboard. US 1,634,990 1924-10-08 1927-07-05 Carl M. F. Friden Lock input when crank turned. See also DE436212C, FR605270, GB241177. 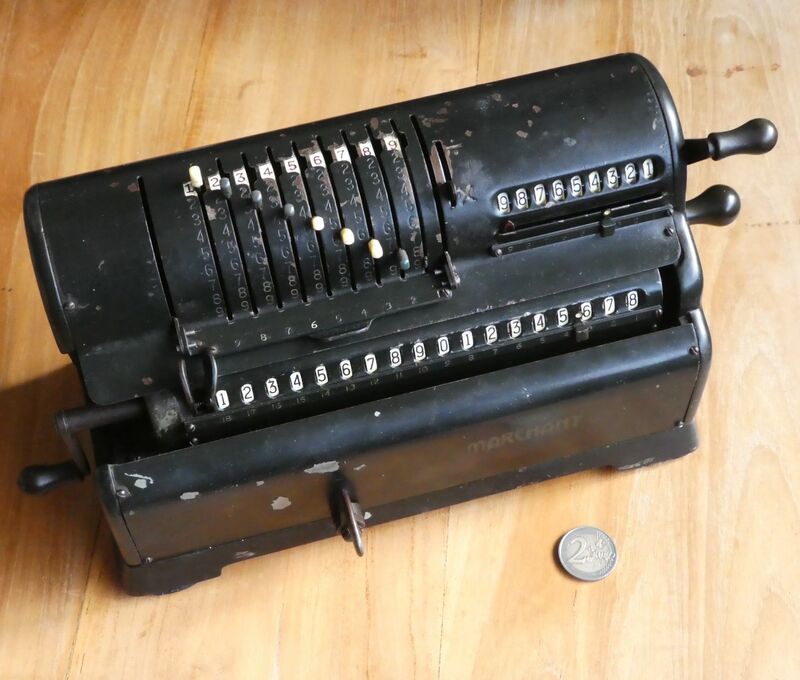 US 1,643,710 1924-02-18 1927-09-27 Carl M. F. Friden Calculator with keyboard and electric drive. See also AT107672B, DE450415C, DK35917C, FI12372. US 1,651,882 1925-10-25 1927-12-06 Carl M. F. Friden Electric drive. US 1,682,901 1926-04-13 1928-09-04 Carl M. F. Friden Reversal mechanism. US 1,913,630 1926-08-31 1933-06-13 Carl M. F. Friden Reversal mechanism. 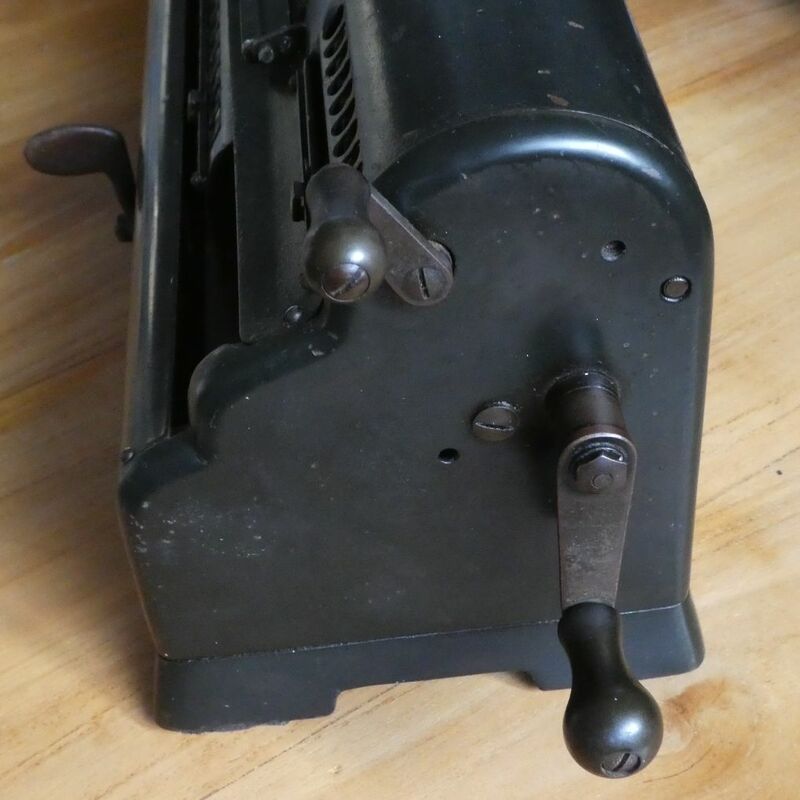 US 1,928,125 1929-05-20 1933-09-26 Carl M. F. Friden Transfer mechanism with rounding. See also CA319671, CH150651, DE574486C, FR696493. US 1,867,603 1930-10-13 1932-07-19 Carl M. F. Friden Carry mechanism. 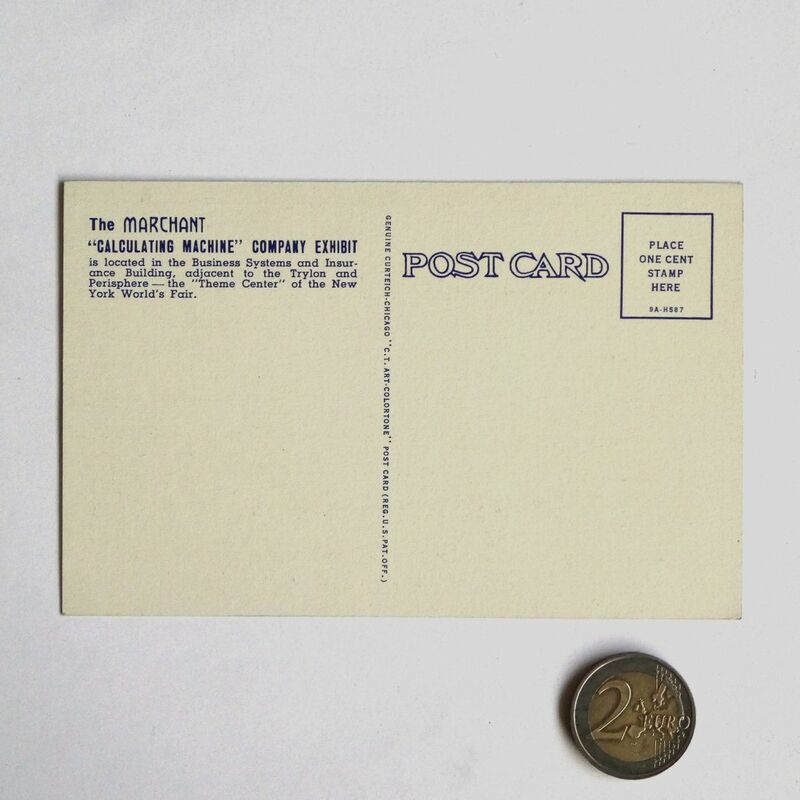 See also CA332510, CH158871, FR723195. 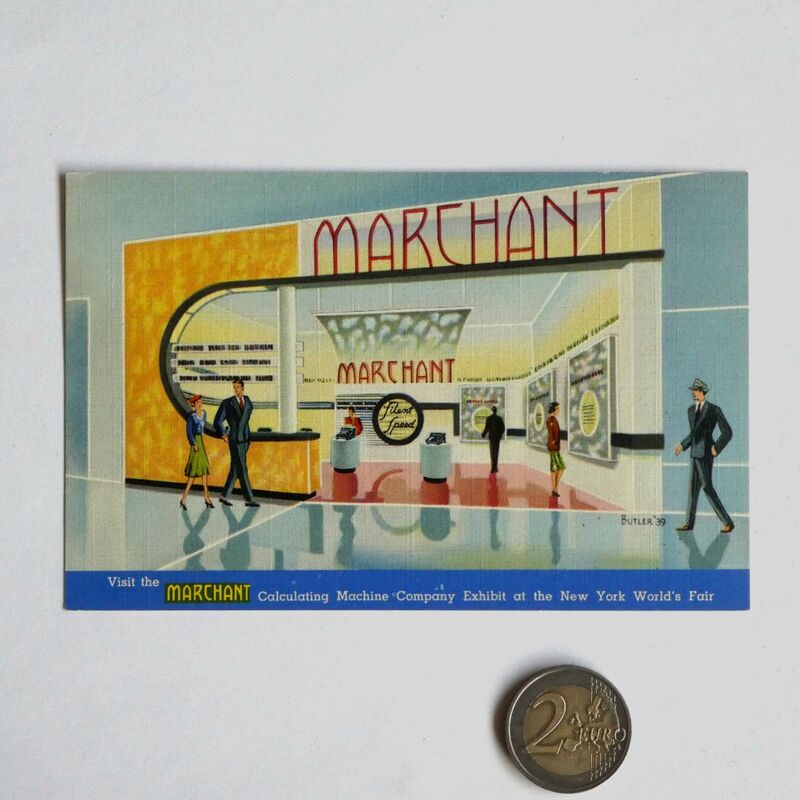 Oakland localwiki has information about Marchant's factory locations and what the buildings are currently used for. John Wolff has a page with various Marchant models and an extensive breakdown of the Figurematic mechanism. 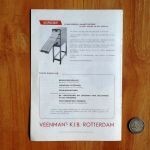 Rechner Lexikon has a page about the Marchant company, as well as pages for the Marchant XL and various other models. Cris Vandevelde has a Standard, a Pony, an XLA, two XL machines, some twinplex XL machines, an H9, and an EEG. 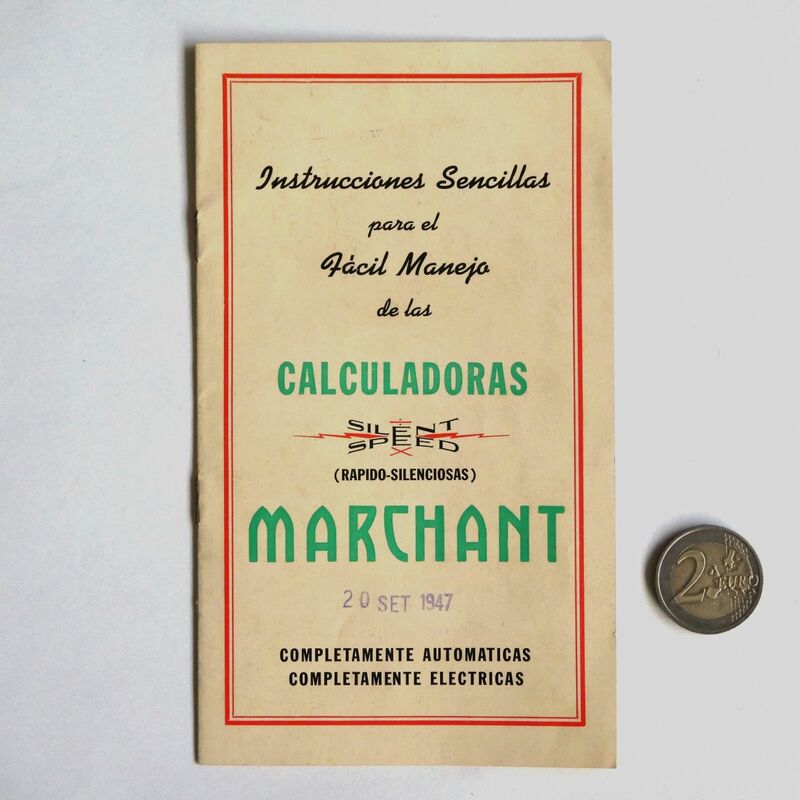 Vintage Calculators has a page about the Marchant company, with some serial number information for later models and examples of their final electronic calculators. 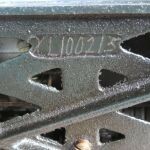 XNumber has an article by Ernie Jorgenson, a former employee, and two articles by Nicholas Bodley about Marchant and the Proportional gear mechanism. 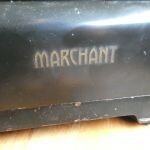 The Marchant XL site with videos of how to use it. 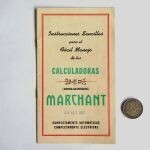 Marchant Calculators site has some history but the other pages have no content.